There are references to the “de Courceriers” in manuscripts of the 12th century, among them Gervais de Courceriers, his wife Marguerite and their children André, Hamelin and Beatrix. A number of Courceriers were named Guillaume . One had a daughter called “Guillemette” who in 1414 married “ Ambroise de Loré” a famous local warrior. He was born in 1395 at the chateau of Loré at OISSEAU (also in the Mayenne) and rapidly became famous for his bravery and numerous victories against the English at the side of Joan of Arc. As a result, the English attacked the Chateau of Courceriers in 1419 in retaliation and despite its seemingly impregnable walls, managed to destroy it. Ambroise de Loré, who had lived there occasionally between battles, died in Paris in 1446 at the age of 52. What you see today are the remains of this fortress, as well as the chapel built in 1418 and dedicated to St John the Baptist, the barn, the pigeon-loft, the gateway (built in 1657 by Guillaume du Bois) with its lodge and the “Bell Tower”, which is now the gîte. The famous historian of the Maine province, abbot ANGOT, records that the tower served as a prison. In 1590 a pretty Renaissance castle was added onto the tower by François du Plessis Chatillon. 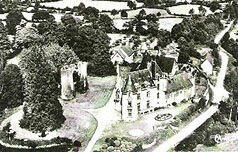 But after the Revolution, the castle left the Courceriers family for good, and swiftly changed hands several times. 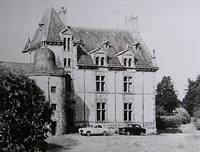 A 19th century wing built by the Violas family replaced part of the 16th century building and in 1960 the castle disappeared completely.